Over 100 holster styles and leather shooting accessories for the hunter. BOX 49702, LOS ANGELES 49, CALIF. I have just read that letter in "Crossfire" of the February, 1959, Guns submitted by Alger L. Thompson, Grants, New Mexico. To Mr. Alger L. Thompson I have this to say: I along with millions of other shooters agree with you 100% on your opinion of the Sullivan Law in New York. Such a law is a disgrace, along with the men who wrote it and the men who are upholding it today. But we in New York State can use our pistols for big game hunting as well as you can in New Mexico, and we can carry our pistols concealed in any town or metropolitan areas except in New York City itself. Y'ou said in your letter "We realize that laws are needed prohibiting the carrying of firearms in towns in the interest of maintaining the peace." Air. Thompson, that statement is just as stupid as our stupid Sullivan Law, and it is an attitude like yours that will put New Mexico next in line for a law like our Sullivan Law. Since you believe law abiding citizens should not carry a gun in towns or cities, then we in New York State are glad, as you are, that you live in New Mexico. Startled, Guns editors wrote to a dozen New York police chiefs /or clarification. Answers received were unanimous, are most succinctly stated by William A. Winfield, Chief of Police of Mr. La Mark's home town, Rochester. Chief Win field writes: "Please he advised that all persons must obtain a license to carry concealed weapons in any city, village, or town in this state. Kindly refer to Section 1897 of the Penal Law of the State of New York." Chief Edwin J. Curtin, of Watertown, N.Y., offers more detailed information: "Permit to possess—required for handguns even in one's home (Penal Law 1897). Permit to carry— required for carrying handguns on one's person or in a car (Penal Law 1896). . . . You, cannot legally have possession of a handgun in New York without a permit." Re handguns for hunting, the Conservation Department, Division of Fish and Came, Albany, N. Y., reports that handguns may be used for hunting in specified counties in the state. No information furnished as to restrictions (if any) on types or calibers. Nevertheless, we do like a man who boosts for his home town or state—in spite of Penal Laws 1896, 1897, et cetera.—Editors. "In answer to your letter of April 6th regarding the Sullivan Act, there is no such legislation pending before the City Council and none is being considered." William E. Lawson Los Angeles, Calif.
Our reply is that we are delighted that no Sullivan Law legislation threatens Los Angeles. The item was submitted to us by a reader who, though apparently misinformed, was commendably concerned and commend-ably alert.— Editors. I have meant for sometime to write you my appreciation of your interesting and comprehensive coverage of the fire arms field. I anticipate the arrival of our copy of Guns Magazine more each month. The vast knowledge of men like Elmer Keith is of course invaluable to anyone associated with guns and hunting. Articles from the newer contributors are also always welcome. The article in the March 1959 issue by William Schumaker showed a refreshing and interesting approach to an old field such as crow shooting. Many thanks for your fine magazine. Alfred A. Akin Technical Director D. P. Bushnell & Co., Inc. Your once fine magazine sure hit a new low when in the March issue you published an article written by sadists; the crow hunting story. Things have come to a pretty pass when such perverse cruelty has to be resorted to that a wounded bird has to be further tormented as to be used as a decoy. Sportsman'!! And on the subject of safety, since when has it been good practice to shoot at a bird in the air with a rifle? I'm sorry to say that great cruelty is practiced on animals in my own State of Maine as we too have a fish and game department that thinks of one thing and one thing only, the almighty dollar. Please give us the usual gun articles and to heck with the stories such as these. Way we read it, the oiol enjoyed being a decoy.— Editors. 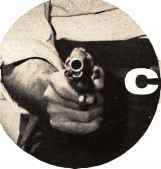 I have just finished reading the fine article, "The Rifleman in Civil Defense." 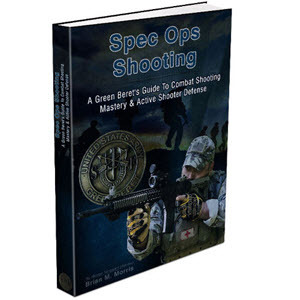 The author says that the men in such an organization should have a .30-06 or the current 7.62 mm (.308) NATO rifle. But I think that if he tried to organize a unit like that around here he would have a hard time getting people to give up their little deer rifles in favor of a rifle of military caliber. 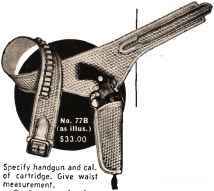 Modern revival of an authentic "Old West" holster and cartridge belt for quick-draw shooting. See Lawrence shooting accessories at your dealer.